This beautiful wooden archway is what is referred to as a rounded or true arch and provides a lovely side entrance to this stucco home. The shape of the top of the door is referred to as more of a flat arch. The door and the sidelights are designed similarly and separated into panes of the same matching, leaded glass. The glass itself seems to be finished with a reflective coating that provides some privacy, though is more transparent than mirrored glass. Each pane is divided equally by a horizontal and vertical line that is lighter in color, which compliments the white stucco of the house. The door lever and plate are both in a wrought iron finish. 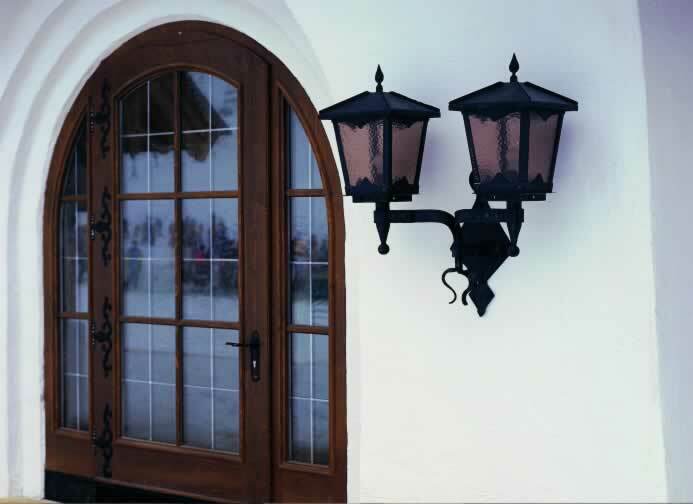 This hardware complements the decorative scrollwork extending from the door's four hinges and the two sconce lamps that are affixed to the home's wall.